In a cemetery on the southern outskirts of Paris lie the bodies of nearly a hundred of what some have called the first casualties of global climate change. They were the so-called abandoned victims of the worst natural disaster in French history, the devastating heat wave that struck in August 2003, leaving 15,000 dead. They died alone in Paris and its suburbs, and were then buried at public expense, their bodies unclaimed. They died, and to a great extent lived, unnoticed by their neighbors--their bodies undiscovered in some cases until weeks after their deaths. Fatal Isolation tells the stories of these victims and the catastrophe that took their lives. It explores the multiple narratives of disaster--the official story of the crisis and its aftermath, as presented by the media and the state; the life stories of the individual victims, which both illuminate and challenge the ways we typically perceive natural disasters; and the scientific understandings of disaster and its management. Fatal Isolation is both a social history of risk and vulnerability in the urban landscape and a story of how a city copes with emerging threats and sudden, dramatic change. "Masterful. Keller synthesizes disparate sources of information into an impressive new explanation of the heat-wave deaths. More broadly, he demonstrates how social status, not only geographical location, predicts survival during natural disasters." "Engaging, provocative, and often chilling. . . . Fatal Isolation is a perfect example of how history and theory can complement each other to work through extreme and traumatic events." "Keller adds some historical flavor to his social autopsy by discussing Paris’ social history of risk and vulnerability going all the way back to the cholera epidemic of 1849. He covers a lot of ground, and while his analysis of the local and national response (or the lack thereof) to this disaster is important, one aspect of his study stands out as particularly interesting: how Paris’s distinct architecture compounded the effects of the heat wave on the city’s most vulnerable citizens." "Keller’s underscores the problems that arise when a society relies too heavily on metrics to manage the health of its aging population. As a historian of medicine, he is well equipped to guide us through a history of modern France’s public health infrastructure that dates back to the late eighteenth century. After reading Keller’s powerful indictment of the 'unnatural' causes of mass death during the Paris heat wave of 2003, we are left with the question of 'what now?' Due to global warming, extreme weather events are likely to become the norm in the twenty-first century. For Europe’s elderly, along with other vulnerable populations, such as immigrants and refugees, there is little time to waste for creating new kinds of housing to meet the environmental challenges of the twenty-first century." "This is an imaginative book that shows the powerful intellectual contribution that social history can bring to the study of public health. The individual histories make for moving, heartbreaking reading. And when these stories are combined with historical analysis of urbanization and dehumanization, especially of the aged, the result is clear: The marginalization of those claimed by the catastrophe was no accident." 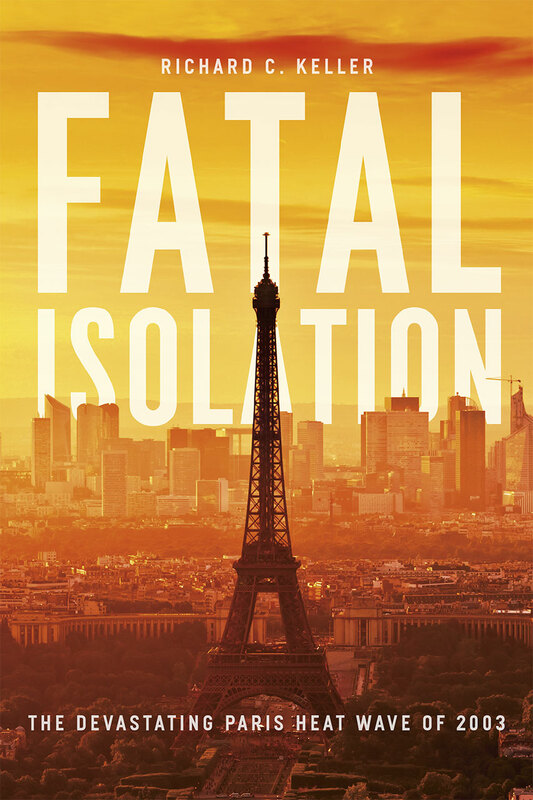 "Fatal Isolation is a riveting account of the social, cultural, and political forces that made France so vulnerable during the historic 2003 heat wave, and a cautionary tale about the dangers of urban life on an overheated planet. Along the way, Richard Keller takes up deep and unsettling questions about what we can and cannot know about the recent past. It’s a memorable, haunting book." "When does urban social policy become thanatopolitics? In Fatal Isolation the 2003 Paris heat wave becomes a site for thinking about excessive, anonymous, forgotten death. Keller goes in search of corpses in a space without narrative, and brings back valuable fragments of anecdotal lives. This is a dense and compelling history with implications for France and beyond." "Keller’s book is an innovative work. Besides offering a valuable description of the intricacies of a public disaster, it also shines a broader spotlight on French society and institutions and the ways they do or do not function to assist and protect citizens."